Nearly halfway through their respective seasons, the Boston University men’s and women’s tennis teams have accumulated varying results. The men’s team (2-5, 1-0 Patriot League) is the loser of its past five matches, while the women’s team (7-5, 1-0 Patriot League) has won three of its last four matches. In their last matchup, the women were defeated by Brown University by a 4-2 score Saturday, snapping a three-game winning streak. Leading the Terriers were freshman Iryna Kostirko and sophomore Barbara Rodriguez, who earned the Terriers’ only two match victories when they defeated their respective singles opponents. Kostirko has been one of BU’s most consistent presences this season, winning Patriot League Player of the Week on March 17 for the 3-0 singles record she compiled over spring break. The Mississauga, Ontario native was a main reason that the Terriers swept their three spring break matches in Florida. During those spring break matches in Florida, BU defeated the University of Southern Mississippi, Western Kentucky University and Florida International University. In their most recent matchup against the Bears (7-4) Saturday, the Terriers were never able to find their footing, as junior Johanna Hyoty was defeated by No. 91 ranked Dayna Lord 6-4, 6-1 in No. 1 singles play, and junior Lauren Davis, competing in the No. 2 singles slot, was defeated in similar fashion 6-4, 6-2. Hyoty has gone through a rough stretch lately, as she also lost 6-0, 6-2 against Yana Koroleva of FIU (6-6) in the Terriers’ win on March 14. Hyoty and the Terriers will look to rebound next week when they travel to Yale University Sunday and face off against the University of Connecticut on April 2. The men’s team has not enjoyed the same success. The Terriers have not won a match since Feb. 22, although they did come close in their last match against Southern Miss (13-5) on March 13. BU fell 4-3, but almost came out with the win thanks to the performance of junior William Kwok. The Terriers No. 1 singles player won the first set against sophomore Wen-Po Tseng, dropped the second one and, in the final set, it came down to a tiebreaker. After being tied 6-6, Tseng downed Kwok 7-4 to help Southern Miss earn the team victory. 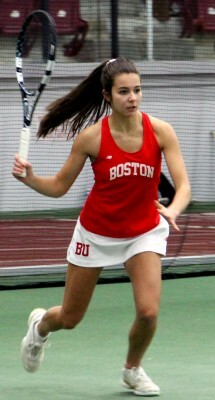 In singles play, BU posted victories in the No. 3, No. 4 and No. 5 slots, but lost two out of three matches in doubles play. In the last four matches before that, the Terriers did not win more than one individual matchup, and the team was completely shut out in a game against No. 49 Brown on March 7. Over spring break, the team finished with an 0-3 record, with Kwok losing in every singles match, although he came close in several. Against FAU on March 12, Kwok narrowly fell to Will Neuner 6-2, 6-3. The real MVP for the Terriers over break was sophomore Jay Leelavanich, who was the Terriers’ only winner in all three matches over break. Last season as a freshman, Leelavanich was first on the squad with 15 singles wins, mostly in the No. 5 and No. 6 singles slots. The Canoga Park, California native is a perfect 5-0 so far in No. 3 singles play. In their next matchup, the Terriers will continue their Patriot League schedule against the United States Military Academy on Saturday and at Lafayette College on Sunday.